Rate this Article VR technology is not only proving itself in the gaming industry but in other applications as well. One of these is in the field of Health and Fitness. Let’s take a look at how they are using it. When people think of video games, a person seated in front of a PC, a gaming console and monitor, holding a handheld mobile device or standing in front of an arcade game machine is what usually comes to mind. However, with the development and introduction of the Dance Dance Revolution games and others of its kind, players have began to work some sweat while playing games. Aside from dancing, sports oriented games that require the player to move around in front of the gaming device by mimicking real sport actions like boxing, playing tennis or swinging an imaginary club to hit the golf ball can be considered a form of exercise. Considering that these activities usually require several players for an optimal experience, the end result would be a combination of working up a sweat while socializing at the same time. Usually, a camera or sensor device kept track of the player’s movement and used a screen to display the results. Then, along came Virtual Reality which created and provided a new opportunity to use video games to exercise one’s self and work out a sweat while having lots of fun at the same time. When merging video games with fitness programs, the entire playing field takes a step beyond the usual. The difference with just playing games (whether dancing or movement video sports) is that and exercise program adheres to a strict and rudimentary schedule as the objective is to reduce one’s weight and bolster one’s strength and health through a series of exercises which have been tried and tested through the years. Sports and games means one is playing. Rigid exercise or working-out is considered working and work naturally gets boring. Believe it or not but most of us need a certain push when it comes to work. The temptation to give up on inertia is great as we as humans have the tendency to be lazy. However, not discounting the fact that a lot of workaholics remain stationary for long periods of time and therefore are far from lazy, the body needs the exercise to counteract obesity which places the heart at risk. Game developers have started to address this health and fitness problem by enticing people to exercise. A player may have to exert a lot of effort, sweat a lot and grow tired but at least have lots of fun doing it and end up healthy as a result. You don’t have to go to the gym to exercise though doing so and following a scheduled program is much recommended. Just by walking you get the chance to exercise but to make things fun with the use of VR, you may need to use popular exercise devices such as treadmills, exercise bikes and the like set up to work with your VR device and specially designed exercise VR game. 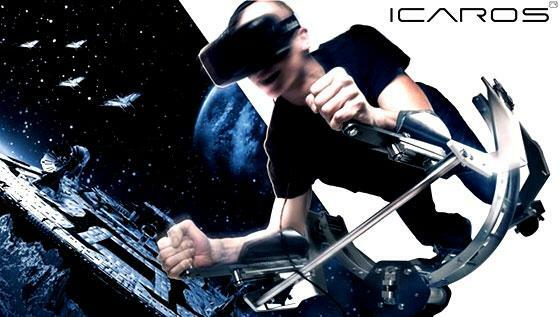 VR will immerse you in a totally awesome reality that would make you forget that you’re on a stationary bike pedaling with all you’ve got just to hit your target or win a race. You’ll just feel really exhausted afterwards as you exit VR and snap back to reality. VR exercise systems like the Icaros exercise machine that you can strap into will pull you into games where you are flying up in the air hitting specific targets or floating in deep space or under the sea that will provide you with an awesome gaming experience while exercising your body in a methodical way. Another example would be the VirZoom exercise bike VR system that also makes use of FitBit fitness tracking that records the amount of calories you burn and other pertinent physical information and post them on the internet which you can access via their website. You also have the option to share this info with colleagues, friends and families who are also into fitness through social media like FB and the like. Also, a company nemed Blue Goji has been developing both video and VR games specific for the fitness industry and uses the usual exercise machines set up for VR as well. If going to the gym isn’t that appealing or convenient for you, then your best bet would be the myriad of VR games that will cause you to move around, swing your arms and legs or jump up and down while in an altered state of reality causing you to exercise without you even knowing it. Games like AudioShield comes to mind. Whether you use an HTC Vive, an Oculus, Sony VR, Gear VR or the venerable Google Cardboard smart phone combo, VR games that use this devices to get you to exercise on your own or with a mechanized partner are available and fun to use. That said, there’s just no reason for anyone who can and should exercise not to exercise. VR is here to usher us into a new and innovative future, so let’s make the most of it.